In late October, Apple released new versions of its iWork office suite – Pages, Keynote and Numbers – which had all been rewritten from scratch. Upgrading was easy, the new versions were free, and so lots of people hit the download button, myself included. The apps are pretty, with a nice simplified layout, and are designed to match the iOS versions very closely – with full document compatibility. Now, I’ve been a big fan of iWork for a while. It’s been years since I used Microsoft Word voluntarily, because for most documents I prefer Pages. 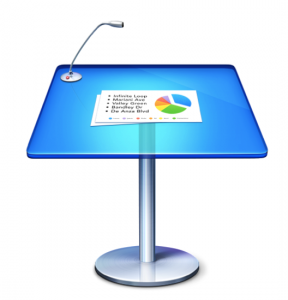 Keynote leaves Powerpoint way behind – haven’t used that for years either. Excel, though, is still definitely superior to Numbers, if you’re a power-user, but for simple stuff I prefer Numbers too. However, with these new versions, there were issues, basically because many features had not yet been rewritten, and hence were just left out. Uproar ensued. The first thing I missed was the ability to customise the ‘presenter display’ on Keynote. Rose has just found out how inferior the ‘Export to Word’ functionality is in the new Pages. And a quick glance at the ratings on the Mac app store will give you a whole list of other things that have caused distress to others. This has been quite a publicity disaster. So much of the good will that might have been associated with a high-quality and completely-free office suite has been squandered because Apple didn’t admit beforehand that this was a cut-down version to get started. And you’d have thought they would have learned their lesson by now, because the last thing they did this to was the video-editing package Final Cut Pro – another complete rewrite – which was one of the biggest launch disasters for some time, losing huge numbers of loyal users in the film industry to Adobe’s competing package, Premiere. But Final Cut is also the thing that gives me hope for the future of iWork. Because over the next couple of years, Apple quietly pushed out update after update – 10 in all – to the point where Final Cut Pro X is now a very fine piece of software, which I’ve enjoyed using extensively in recent weeks. Rewriting or replacing a major software package is an enormous task, and many companies just don’t have the guts to attempt it. I suspect that, in future, we’ll see that what Apple can do with both FCPX and iWork — because their underlying chassis has been modernised — will give them big competitive advantages. But they need to learn, when they introduce such radical changes, to make it clear that this is not the same as the previous version and to show a development roadmap so users can feel confident about hanging on, rather than jumping ship. Sadly, it’s not in Apple’s nature to admit, in advance at least, that anything is not perfect. But it’s better to do that than to be forced to admit it in retrospect. The first implies confidence, planning, and honesty. The second implies that you were either dishonest, unprepared or foolish. I wonder if the marketing guys can understand the distinction.